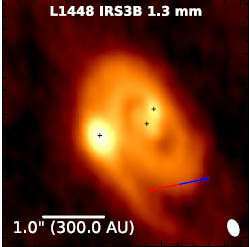 An ALMA millimeter-wavelength image of protostellar binary stars early in their formation. (The length scale and the size of the telescope's beam are shown at the bottom.) Astronomers have studied seventeen multiple systems and found evidence supporting the model of multiple stars developing from disk fragmentation. Credit: Tobin et al. Most stars with the mass of the sun or larger have one or more companion stars, but when and how these multiple stars form is one of the controversial central problems of astronomy. It's only controversial if gravity is the only tool in your toolbox. Whereas if EM is considered the binary problem is no problem but an expectation. Lol. Youtube! Where is it written up, so that we can laugh at it without wasting bandwidth? Yep. I'd already assumed that :) Science is a foreign concept to the mythologists. Science is a foreign concept to the mythologists. As the darkists blame all on everything dark, black, and invisible. You must have a simple explanation for the pervasiveness of the binary which has no explanation from the gravity only perspective. I bet there is a dark faerie twirling in her dust to create a mirror image of itself. Voila! ALMA is an extraordinary instrument. New data and new understanding seem to come from it on an almost weekly basis. It's visually quite impressive, as the VLA is (see the movie 2010: Odyssey II for film of the VLA). Like the VLA, its antennae can be moved to configure it for various tasks (often referred to as "zooming in or out"). The light it detects is millimeter and sub-millimeter; this is EHF microwave and terahertz radiation. It is notable that this type of radiation has great penetrating power through gas and dust. This particular discovery is very important to star formation theories, and seems instead of dismissing either of the two main theories to show that multiple star systems can form either way. The more we look the more we will find out. This instrument will be making new discoveries for decades to come. You can smell the crank trolls when they start rejecting data. "You can smell the crank trolls when they start rejecting data." Data that only specialists can make head nor tail of. Try creating an image from ALMA raw data and lets see your results. And I have yet to see proof that any of these objects are even stars, and there will never be any such proof. don't yall eu ever get tired of being proven wrong? Look at the orbital data, use Kepler's laws. Idiot. Ahh cant & saloon, preaching their cant of befuddlement. Complaining that DM/DE & Gravity are invisible & therefore "cant" be true. While worshiping invisible deities, flinging invisible thunderbolts from invisible heavens. For the good of our invisible souls! You two frauds should contemplate the definition of cant. You are both in violation of the moral standards your primitive tribal superstitions claim to personify! So Captain, you will take on the task of producing an image from the ALMA raw data? I have to use the ALMA data for the purpose of "producing an image"
Data that only specialists can make head nor tail of. And that is why we have specialists. You would not expect a bricklayer to perform neurosurgery, would you? And not all raw data is impenetrable. I have said to electric comet wooists to go look through the Giotto and Rosetta magnetometer data for their non-existent discharges. And to see that there is a cavity around the comet devoid of a magnetic field. I downloaded the Giotto data, and it is clear as day. 0 nT = no magnetic field = no electric discharge woo. That data was available many years before the idiots Thornhill and Talbott invented their crap. As were the papers reporting it. "And that is why we have specialists." Ah yes, specialists. People who know more and more about less and less, and couldn't explain what they do know to a barmaid. "No physical theory is worth much if it cannot be explained to a barmaid." And why is the proprietory data in ALMA information when the data has been collected at the taxpayers expense? Something doesn't smell right. I'll tell you what they're not doing: they're not making it all up. That's one hell of a lot of expensive equipment and expensive computer time they're using. Oh my the cultist Utron jumping in to defend his sockpuppet fellow woodolts. Where is your contribution to the data? From any of you frauds? Where is your patented inventions based upon your cultist delusions? No. the ouiji board and brass spirit horn do not count. You scammers weren't clever enough to invent those tricks! to inspect & confirm the validity of your claims. Unfortunately, @rrwills, even stage magicians can be fooled. James Randi never admitted anthropogenic global climate change and I got kicked off his site for presenting evidence of it. (followed by a conspiracy theory). Since you believe in made up conspiracies rather than data - and note that ALMA is too large to even be a conspiracy (but you need to study data on conspiracy theory modeling to see that) - our responses is not for you but the people you want to share your delusions with. Experts are ... well, experts. They have made the internet you comment on, so obviously they know more and more correct in general than you do. Common people grok ALMA. Why don't you? You sound like medieval inquisitor, full of hate, calling for torturing and killing of heretics. I can assure you, I personally do care a lot about data and observations. Im just disgusted by watching "professional physicists" selectively using data which suits them and ignoring data and facts which are not in line of what they want to push through. Many of you are old fools that know to much to learn anything, and are always forgetting history.